Thank you also to the committee chairs; Karl Hoff for monthly programs, Robert Bley (returning for 2014) professional artist demonstrations, Jim Laflin as purveyor of Anchor seal, Richard Winslow - Craft Supply Orders, Pat Crowley for holding the CA glue sales together and LeRoy Nelson for keeping us wide eyed with coffee and cookies. I would also like to express my thanks and appreciation to Terry Gannon for his outstanding efforts in creating and maintaining our club web site. Terry is relinquishing the day to day operating of the web site to Tom Haines. If you are one of the members who has not visited the web site you should take the time to browse through the articles and links that Terry has so skillfully designed. On behalf of the club, thank you again, Terry for all your efforts. Notes of interest: For those of you who are familiar with the turnings/sculpture of Stoney Lamar, you have an opportunity to see an exhibit of his work at the Museum of Craft and Design, 2569 Third St. San Francisco, CA 94107 from now till March 23rd. He does large scale multi-axes turning/sculpture pieces which are represented in many private and corporate collections. Possibly of interest to novices, is the recently published magazine format “Turning” by The Best of Fine Wood Working. It contains short concise articles on tool selection, use and methods of wood turning, with plenty of projects to pique your interest. Authors such as Jimmy Clewes, Richard Raffan and others provide photos and text to help guide the reader. Look for it on news stands for $9.99. Not a bad deal, that is unless you already have dozens of books. 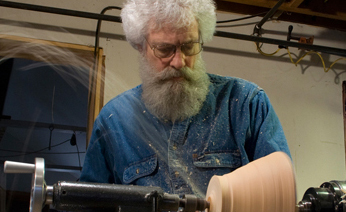 Please take the opportunity to click on the new link Tutorial, “Wood ID” located on the home page of the club Web Site: http://www.westbaywoodturners.com/ . Good reference to finding out what was that wood you found in your back yard. Dennis Lillis demonstrated hand cut thread chasing and machine cut threads using either hand held threading tolls or a Baxter Thread Master jig. After many scheduling delays we finally were able to fit in the Thread Chasing demo by Dennis. He imparted the challenges and best practices of using hand chasing tools as well as the sophisticated Baxter Thread Master jig. This was a very interesting and unusual demonstration. Dennis had on hand several examples of finished pieces, such as lidded boxes, urns and specialty containers as well as a variety of tools that he uses to create threaded lidded containers. One source of the hand tools is Craft Supply. Baxter may be found here. January Presidents Challenge: Turned Christmas/Holiday presents. 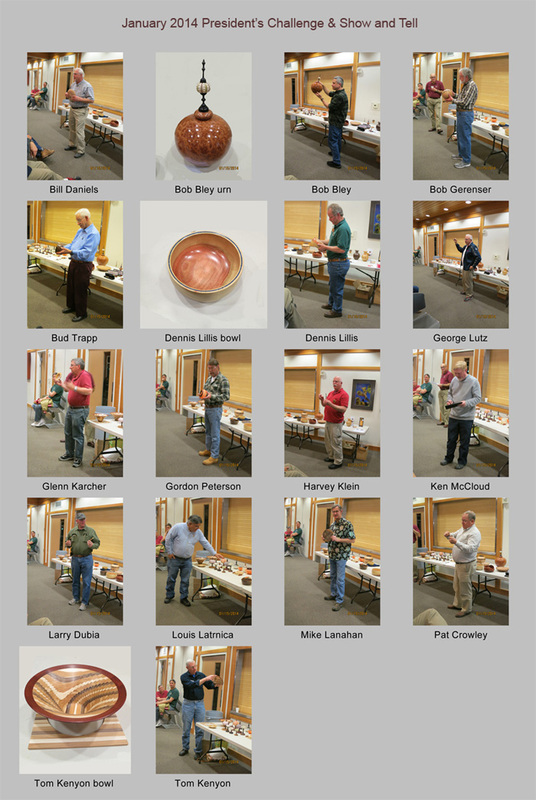 Participants include George Lutz (Pen), Harvey Klein Pens & Ornaments), Pat Crowley (Pens), Dennis Lillis ( Carob Bowl with Lapis inlay), Tom Haines (vases with engraved names), Larry Dubia (Pens) and Bud Trapp. Look for pictures in this news letter. The DVD library has been returned (pun) and magically restored by Bill Daniels. The library is organized so that titles, subjects and areas of interest can easily be identified. Check out the new library format and check out a DVD. 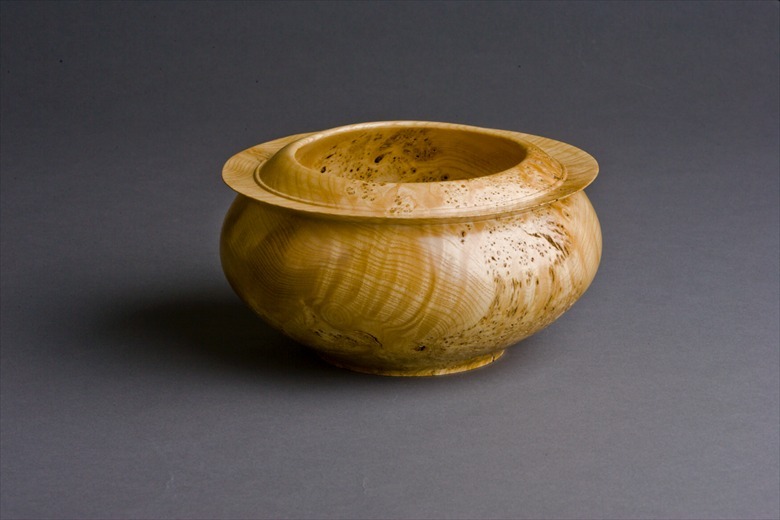 Presidents Challenge: Turnings from Green Wood, either finished or still wet. Upcoming - Ellsworth on March 9, 2014. Location: Covington School at 201 Covington Rd in Los Altos.